List all of the text features you found on this page. Draw an example of bold letters. Explain where you would find the table of contents of a book. Point at the bullet points on the page. Explain what a table is in your own words. How are a photograph and an illustration different? How are captions and labels alike? Which text feature best supports the main idea of this paragraph? What text feature should you use to figure out the meaning of a word: an index or a glossary? Based on the text features in this book, what do you think the book will be about? How could you use the title or headings of this book to predict the main idea? In what other situations would bold letters be useful? What caption would you write for this photograph? What text features would you include if you were writing an article on basketball? Organize the information in this paragraph into a table or chart. Write an appropriate heading for this paragraph. How do the text features on this page relate to each other? If you were asked to divide the text features on this page into 2 groups, how would you categorize them? What inference can you make about this book based on its text features? How do the text features on this page relate to the text? Compare and contrast two of the text features on this page. Explain the different parts of the diagram or chart. What text features are included within the diagram or chart? Which text feature was most useful in helping you understand the text? Which text feature was least helpful to you in understanding the text? Where in the text could the author have added a table, chart, or diagram? Which text feature is the most important to nonfiction books? Why did the author choose to add this text feature? Which text feature did the author use most effectively? Write a nonfiction article that includes at least 6 different text features. Create an additional text feature for this book. How would this book have been different if the author hadn’t included any photographs or illustrations? Choose one of the text features on the page and write your own paragraph to support the text feature. What text feature could be added to help you understand the text better? How would the book have been different if the author had not included any headings or titles? 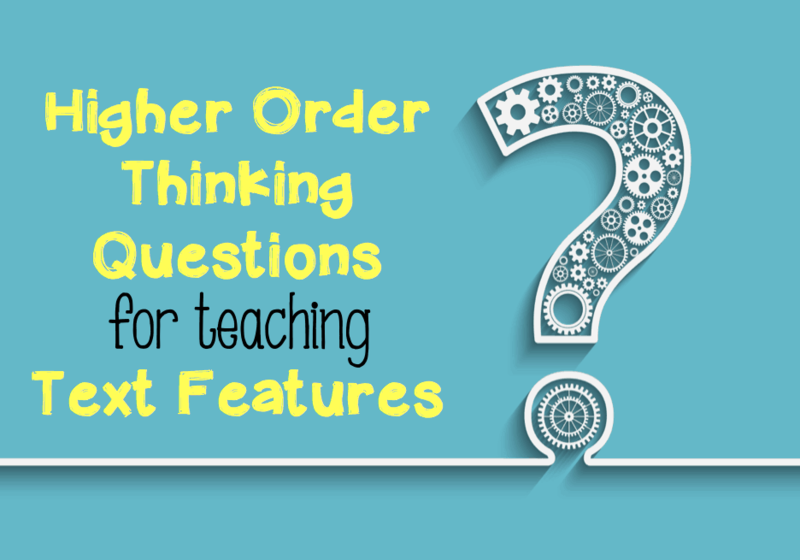 Use these text features questions to promote higher order thinking skills in your students. My Text Features Task Cards also ask many higher order thinking questions about text features and are ready to use! Don’t Ever Stress Over Sub Plans Again! When you subscribe to my newsletter below, I’ll send you my Reusable Sub Plans for FREE. You’ll also get updates on new blog posts and freebies. 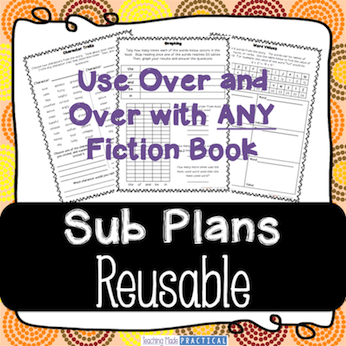 Click Here to Download these Reusable Sub Plans for FREE! I love those sub plans. They are ideal. Do you have any for Non-Fiction? I don’t have any nonfiction sub plans. I like that idea, however – I might look into creating some in the future. Thank you for these resources. They have helped me a lot. These are very interactive and helps my students to use their higher level thinking skills. I’m so glad you have found some helpful ideas! Thanks for this resource. Check the PDFs heading. It says Character Traits. Thanks! It has been updated. I love this free resource but the text features PDF says character traits at the top. Thanks for pointing that out! I’ll update that. Check the spelling error.. evaluation. I love this and plan to share it. Thanks for pointing that out! I plan on turning this information into a pdf document so that its easier to print, so come back and check for that!